Tonight’s messy situation was submitted by Tonya*! “My question is about how to best utilize the space in my house to make my mud room less of a disaster. We have a very small entryway as you can see, and both the front door and back door lead into it in addition to a bathroom door opening up into it. “The bench does open up and holds winter hats and mittens. But, one has to walk through the bathroom to get into the mudroom, which makes everyone less inclined to actually hang their coat in the mudroom or put their shoes in there. “We do not have any closets on our main floor. No coat closet or cleaning closet, so our mudroom contains coats and shoes, etc. and cleaning supplies. I make my own cleaners, so I have big bottles of vinegar and Castile soap and boxes of baking soda to store. I also buy food in bulk which makes storing that difficult, too. Tonya, you have some great questions and it looks like you have a pretty good handle on organization! 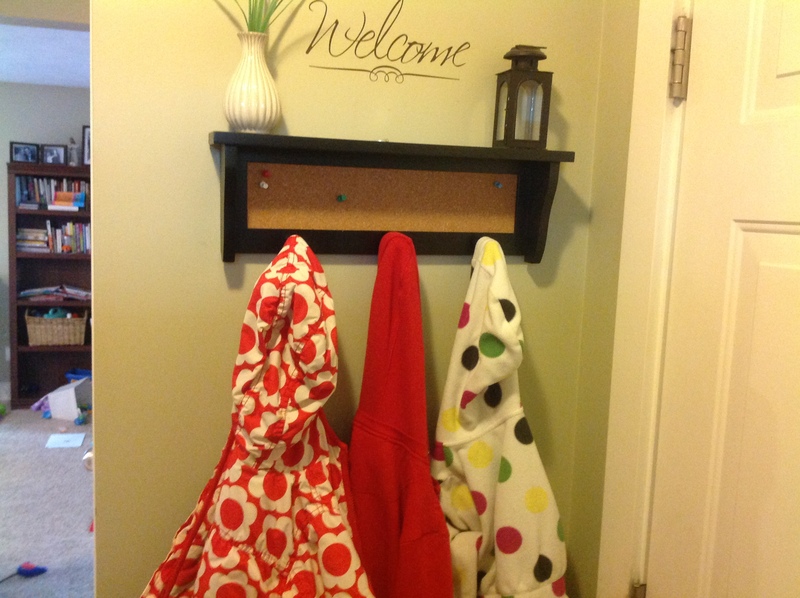 I love the wall color and the little coat rack with the welcome sign by your door! Have you considered only allowing one coat and one pair of boots per person in the entry area and having your family members keep the rest in their closets, thus completely removing all shoes and coats from the closet? I don’t have a coat area by my door either, so my family keeps coats and shoes in closets with the rest of our clothes (when they’re put away, that is!). Since you do have the lockers in your garage, you may also want to consider using those for dry coats and shoes if you don’t have room in your bedroom closets which will still allow you to keep the main closet free of clothing. I also want to encourage you to think outside the box – who says those lockers have to be used for coats?! If you move most of the coats and shoes to bedroom closets, maybe you could choose a few of the bulk cleaning supplies or food products that can withstand the cold to move to the lockers. It looks like your pantry is fairly organized, but it seems that you may want it to look a little more attractive. I recommend reading this article I wrote about how to organize a pantry – it includes tips for how to make a small pantry more attractive, plus the pretty pet food storage idea may be something you could try out for some of your cleaning supplies or bulk food items instead. 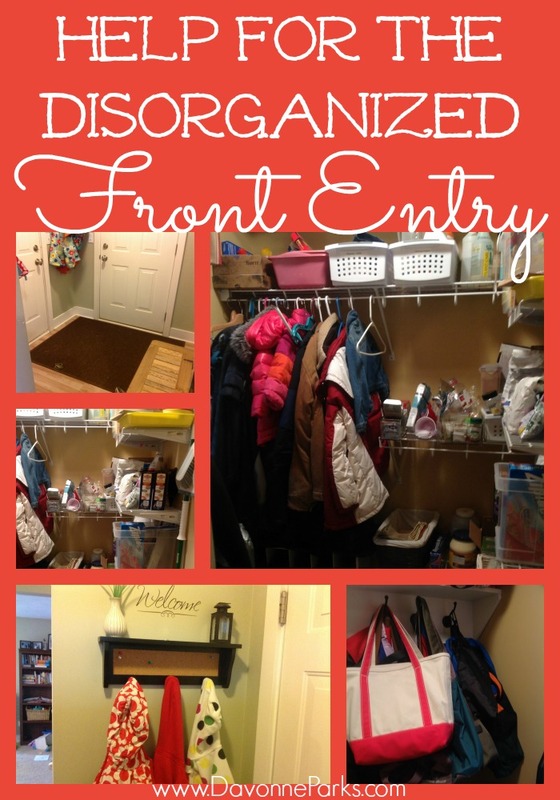 I also notice a lot of hanging bags in one of the photos – I recommend limiting the bags to one per person and moving the other bags to bedroom closets so they don’t clutter up the closet or entryway. Or consider putting the extra bags into a basket or bin inside the pantry to keep them nearby but out of the way. Really, though, your space doesn’t look bad at all and I think that a couple hours of reorganization will give you a space that’s both beautiful and functional for your family! Thanks so much for submitting your questions, Tonya! I hope this helps you out and don’t forget to send after photos when you’re finished!